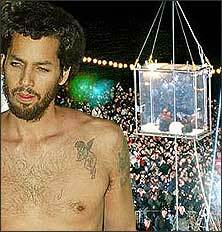 So how do other magicians and illusionists rate David Blaine’s 44-day show of starving himself in a perspex box hanging by the Thames? They reckon it’s more of a stunt than a magic trick, and some go as far as to say Blaine is a new Houdini – risking his life for his craft. Sid Juter, retired president of the International Brotherhood of Magicians’ Sydney chapter said: “I personally think it’s for real. I think this is just an extreme publicity stunt. Nevertheless, even though “David Copperfield would like this sort of publicity”, Mr Gauci said Blaine was not in the same class. “It’s one thing to put on a full night’s show with all types of tricks and another to lock yourself in a box or block of ice or whatnot,” he said. Mr Blaine’s previous tricks have included freezing himself in a block of ice and burying himself alive in a plexiglass coffin. Mr Blaine’s box was transparent and displayed in a popular tourist area, allowing viewers to watch him at any point in the day. Illusionist Brendan Montana of Montana Magic said those conditions would make an illusion difficult to create. Mr Gauci said the publicity generated by this stunt could lead to more interest in magic and illusion by the general public. And while he said Mr Blaine’s latest stunt doesn’t qualify as an illusion, Mr Gauci said he does take his hat off to him.